The railway market represents a large share of FLERTEX activities and covers two product categories: brake pads and brake shoes. 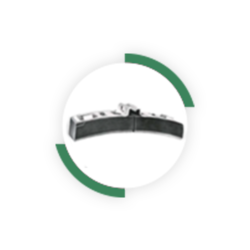 As a long-standing supplier of sintered metal disc brake pads for very high-speed trains for over 20 years, Flertex Sinter has extensive expertise in high-energy rail braking market. This expertise has also benefited other rail applications such as locomotives, regional trains and trams. Indeed, such products can offer effective technical solution on all types of railway vehicles when, for example, the number of brake stations are limited due to weight constraints. For several decades, Flertex Sinter has been offering its brake blocks for the locomotives of high-speed and high-mass vehicles as well as for applications where climatic conditions are challenging. Our brake blocks are also used on freight wagons, offering comparable frictional performance to composite brake blocks with the added advantage of much longer service life.